You would think that for all the stamping classes I run and projects I make for swapping and my blog, I would always be prepared for holidays. Ha! They sneak up on me like my 3 yr old when I think he is taking a nap and jump out at me at the last minute. Thankfully, I got a head start this year and have a card all ready for Dad when I see him on Sunday. I wanted a little bit of texture and so I grabbed some of my Pool Party Core’dintations cardstock for the shirt. Normally I sand down this paper but I liked it for that subtle texture it provided. For the rest of the shirt, I hand drew and cut the tie. 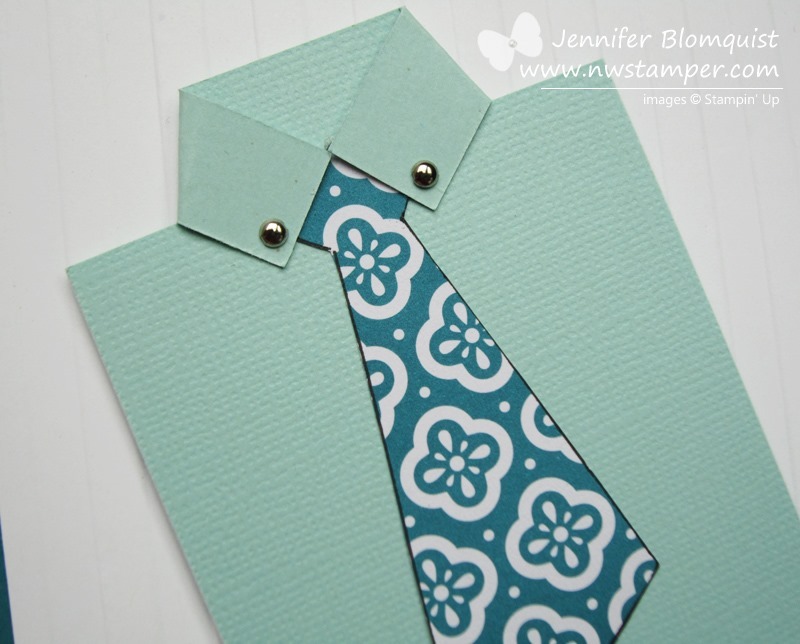 I didn’t realize that most people when they create these cards, have a template they have created for themselves for the tie! 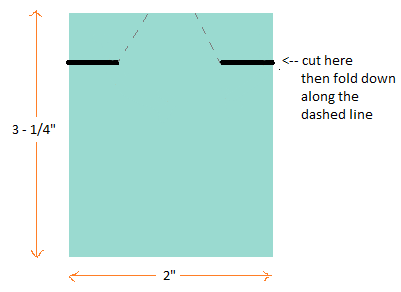 So, I made myself a template and hoped it didn’t look too lopsided. Add a few silver mini brads and ta-da! The shirt is done! 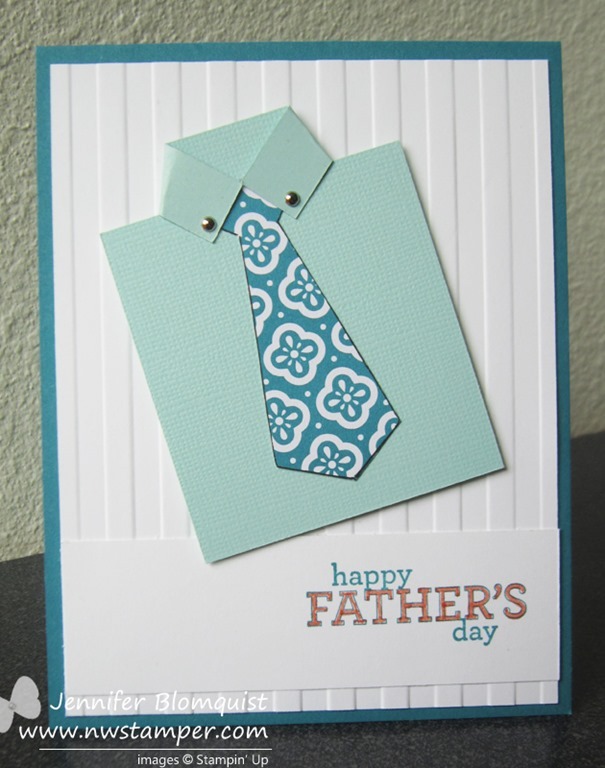 So if you need a quick Father’s Day card idea, try this one out. It is fast and easy, and quickly customizable to any colors or patterns you want! Give it a try and then stop by my facebook page and let me know how yours turned out! And let me know if you come up with a better way to do the tie other than freestyle! No seriously, you are! As I think back to how my life has evolved and changed over the last few years – between major moves and babies and family adventures; I love that I’ve always had my friends and stamping community there for support and to keep me sane! 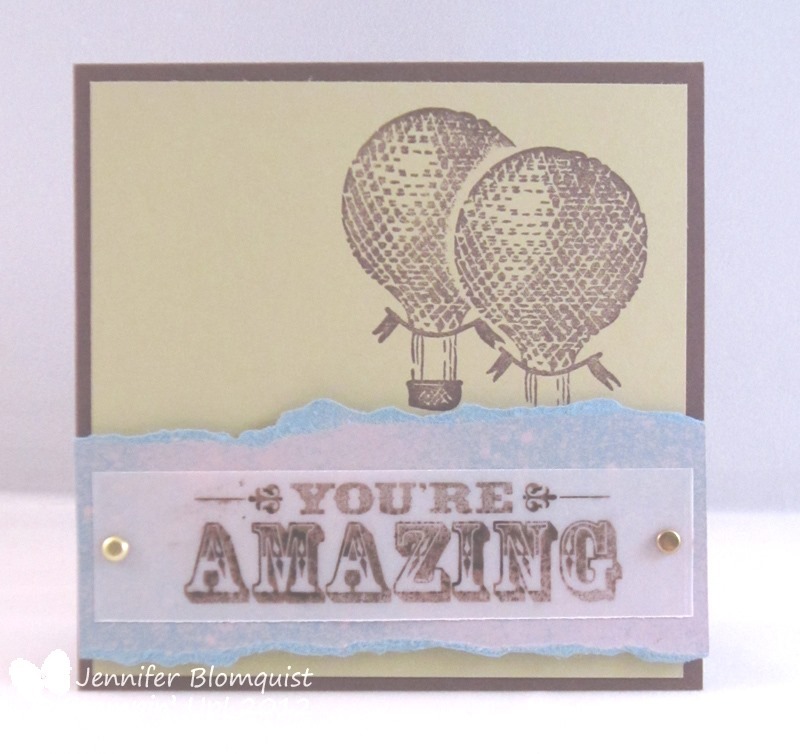 From friends in facebook groups to my fellow Stampin’ Up! demos, I always feel like I have somewhere to turn when I need support or a pick-me-up. 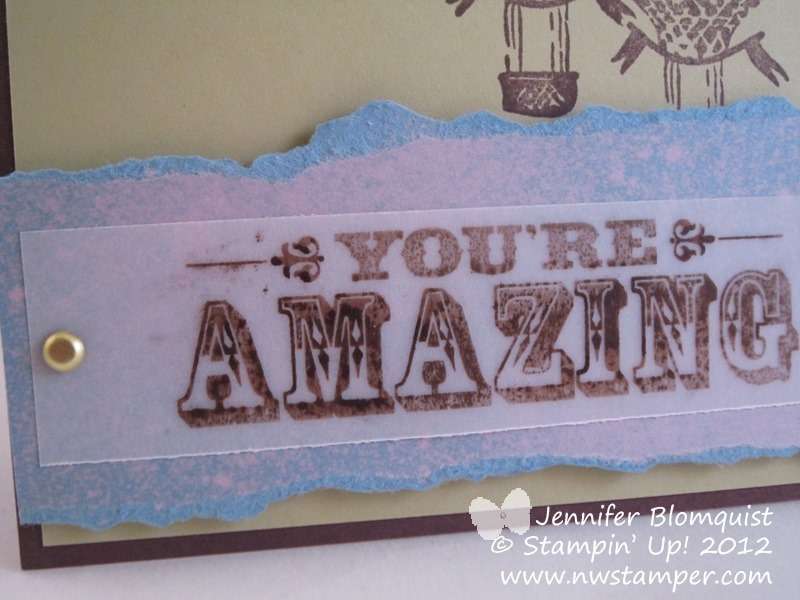 And you are part of that stamping family & community and for every layout you make, project you share, card you send; you are making the day that much brighter. And so I think you are amazing! And just a little close up for those of you curious about the paper… this card is from my Misting & Masking technique class and we used bleach in a spritz bottle to spray some Marina Mist cardstock to get this cool look. Then layouer our sentiment over the top in vellum so you can see it peeking through for a fun effect. So think about who has been amazing to you in your life and take a minute to tell them! Send them a card or just give them an extra hug. You’ll brighten their day like they brighten yours.